Get yourself to the Dolphin Rally in Port Elizabeth from 4 to 6 October 2013 by entering to WIN one of 3 entry tickets. Your prize will include; an entry ticket, the official Rally Badge and tickets for the Friday and Saturday night lucky draw. Answer the question: Where in (venue) Port Elizabeth will the Dolphin Rally be held? Unlimited sms entries per person – this is a lucky draw so enter often to improve your chances of winning. Only open for persons 18 years and over; Competition closes at 6pm on Thursday 26 September 2013. 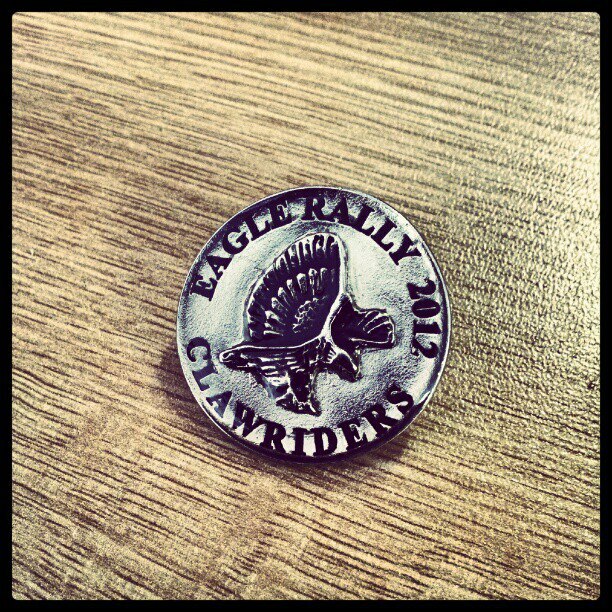 Winners will be announced on the Biker Show on Saturday 28 September 2013. GOOD LUCK! SMS costs R1 each and free minutes do not apply. A repost of the note posted by Trevor Davids – the originator of the Bush Radio Biker Show. Thank You to the Bush Radio management (Brenda and Adrian) who agreed to provide us with a weekly 3 hour broadcast platform to promote a positive image of biking especially around the safety aspect, even though they were ‘sold’ on a concept that was written to a three page proposal. A humongous ode of gratitude to Lloyd Castle, Riki Turner and Jessica Zandberg who formed the original broadcast team as co-presenters and trainee producers – although they had very limited broadcast experience prior to the 1st broadcast, they believed in the vision and mission of The Biker Show. Their encouragement, energy, input and enthusiasm contributed to the format (and enjoyment) of the the Biker Show. Thank You to Shannon-Leigh Torien and Xanthé Zealand stepped into the world of live radio broadcasting in August 2012. Their unbridled passion for the camaraderie of bikers and the culture thereto, is a major factor in the way they took to broadcasting – they belonged there! In October broadcasting veteran and biker Richard Green took over the anchor spot and the Biker Show reached a new level. Richard stamped his enthusiasm, knowledge and expertise on to the Biker Show. The Biker Show completed 118 hours of live broadcasting inclusive of 6 outside broadcast transmissions from rallies and day functions. ALL members of the broadcast team are volunteers and currently receive no remuneration for the time dedicated to The Biker Show. The Biker Show is an excellent opportunity for low cost advertising especially targeted at bikers. Contact any member of the Biker Show team for details of advertising packages. The Biker Show Team is looking forward to another year of fun, laughter, interesting chats, biker camaraderie and the promotion of bike safety. A big thank you to all the biker’s, clubs and individuals who came out to support the launch of the Bush Radio Biker Show Winter Charity drive this past weekend (27 April 2013). Almost 2 tonnes of non-perishable food as well and blankets and clothes were collected! Please remember the giving does not stop – we will be posting information regarding more collection points in the near future. Watch a short video clip of Saturday’s mass ride. Winter is approaching fast and to assist those who need help the Bush Radio Biker Show in association with the Wings Motorcycle Club will be launching the BIKER SHOW WINTER CHARITY DRIVE. The drive will take place on the 27 of April 2013 (Freedom Day) at the Shawco Hall, 12th Avenue Kensington from 1pm to 7pm. The aim of the Freedom Day event is two-fold: To get 1,000kg of tinned food and 1,000 blankets on the day and to launch the Biker Show Winter Charity Drive. Our ultimate target is 2,000kg of tin food and 2,000 blankets, and a bakkie-load of winter clothing. Biker’s and non-bikers are welcome to support this event. Collection points will be pubs, shops, restaurants, churches, etc – are in the process of being identified. Biker Show Winter Charity Drive is done on behalf of the Kensington / Factreton Meals on Wheels Organisation. Kensington / Factreton Meals on Wheels Organisation is an organisation that deals with caring for the home-based senior citizens and children. It includes nutritional support, healthcare and general wellbeing. The Bush Radio Biker Show will also broadcast live from the event. 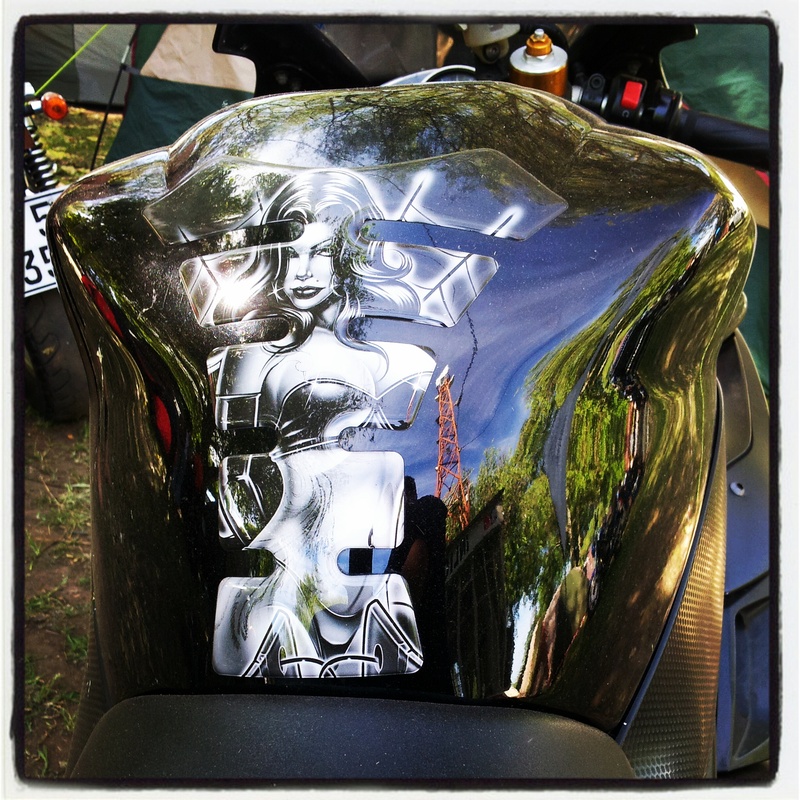 The Bush Radio Biker Show was broadcast live from the 2013 Steppies Rally in Hawston this past weekend. Joing the crew for the first time was Bushradionews intern Athenkosi Mvane. We asked him to give us his take on being at a rally for the first time. What is the first thing that comes to mind when you hear the phrase “biker rally”? For me, honestly; bad mannered, long-bearded, baseball bat carrying, chain-wielding angry men. Saturday would have been the day that would have given me concrete evidence that my stereotypes learned from bad-boy movies were true. I had little sleep the previous night, fantasies of watching tyre burn-outs and drag racing on a long stretch of road had me tossing and turning like a rider on a hair pin bend. The trip from Cape Town to Hawston felt longer than it was; my eagerness to reach my christening into the forbidden world of two wheelers got the better of me. The picturesque scenery on the drive gave little amusement to my yearning. Upon our arrival at the Hawston resort, we were signed in by members of the rally hosts, the Stepchildren Motorcycle Club, who showed us the centre of the event and stage. It was tent next to tent, motorbike after motorbike, braai-stand smoke breathing life into the sea-breeze that whispered relief from the scorching sun that illuminated. There were high spirits in the main tent as the bikers raved the heat away. The Bush Radio technical team set up the stage in preparation for the Biker Show’s broadcast from the rally. This was my first experience of being present during an outside broadcast in my four months with the Bush family. With the equipment prepared, I headed out into unfamiliar territory and joined the biking community. Each of the clubs had set up banners displaying their colours and logos, proudly wearing their cuts* adorned with various rally badges. I met club bikers, freelancers and non-bike affiliated supporters of the fraternity. Richard Appel of Gaansbaai said rallies brought him together with friends from different places who don’t meet for long periods of time. From the Ikon Cycle Club, Bradley Bruinders said the fellowship of the bikers was a time to be around people who share the same vision and bond. One of their biking team-mates had been biking for 28 years. Alec Abrahams of Athlone, who has been biking since 1982, said the fellowship of the different clans is what brings him to rallies. “It is something that grew on me since the first time I saw a motorcycle”. Cuan Edick said his way through biking was unplanned, as he had given a friend some money to buy him a car, and when he had returned home from work, he found a bike instead. “I couldn’t even ride a bike back then” he said. Emile Fredericks from the Claw Riders Club said the biking fraternity is misunderstood by the general public. Their club supports a community crèche with everything the children need; from blankets, to toys and anything that would be of assistance. He boasted that when the Bush Radio Biker Show was started, the Claws were the first club to be invited for an interview. To my surprise I encountered a club named Friends in Uniform who are police officers. Chantell Mutt chairs the club and said the rallies are one of the ways a cop can relax and have a good time. “The rally is fun, its tons of adrenaline from the sounds of the engines and just being in the company of good friends” Mutt said. The experience for me was incredible. I got to a first-hand experience in the presence of the “meanies” and realised they are often misjudged by those who don’t understand the brother and sisterhood that exists between riders. They are not the movies’ portrayal of aggression; they are a crowd with big hearts too. I learnt that there is a body that watches over and holds the clubs accountable which is the Motorcycle Association Western Cape. Under the MAWC registered clubs must adopt a charity of their choice to support. I learnt that, like in any other group there are rivalries but under the MAWC, clubs that transgress the code of conduct (in which respect for other clubs is part of) are subject to penalties. I saw no forms of anti-social behaviour at the rally but witnessed an immense amount of friendship, bonding and respect. Although we had to leave while the festivities were still underway I could not have asked for a better way to spend a working Saturday afternoon. I may have no intention of joining a club soon, but I am converted to the rider lifestyle. Friendship, bikes and rock ‘n roll were the flavour of the day and what happened in Hawston will stay in my mind for a long time. I want to congratulate the Stepchildren Motorcycle Club on a well-organised and spirited event. I hope this will not be the last time I experience a ride on the wild side. Bush Radio‘s Everyday People and Biker Show broadcast live from the 2012 Wys Jou Muis Rally, which was organised by the Sons of Thunder MCC this past weekend at Kleinplassie in Worcester. A big thank you to all the bikers who participated in the very successful Bush Radio broadcast from the 2012 Eagle Rally in Villiersdorp. We hope to see you at the next rally! 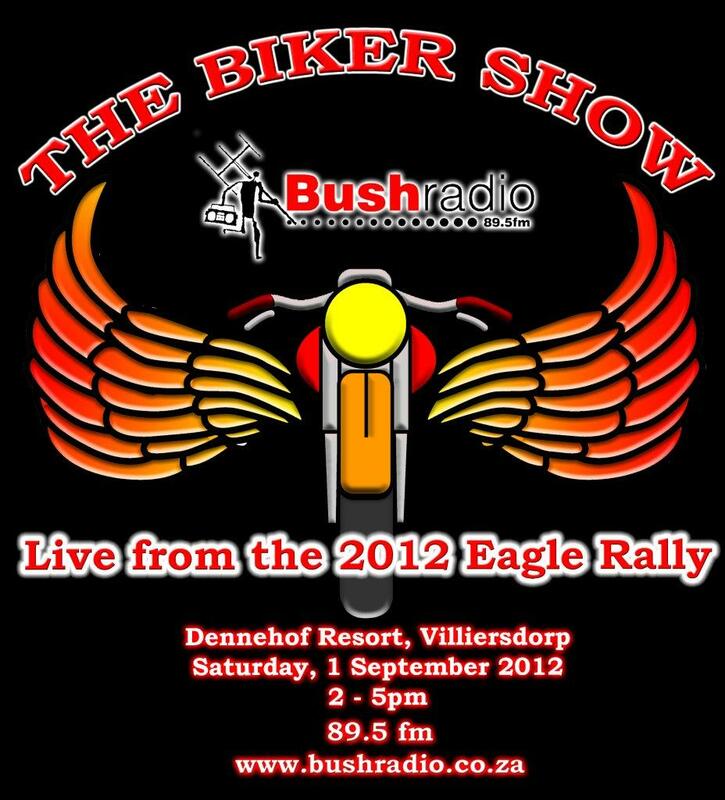 Tune into Bush Radio’s Biker Show this Saturday the 1st September 2012 when we broadcast live from the 2012 Eagle Rally in Villiersdorp – The Bush Radio crew will be bring you all the action from this year’s event, exclusive to 89.5FM in Cape Town or worldwide via www.bushradio.co.za. Remember to check out our twitter and facebook pages for pictures and videos from the event. The first radio show produced by bikers – presented by bikers – owned by bikers – for bikers and every other road user – launching on Africa’s pioneering community radio station, Bush Radio. The Biker Show on Bush Radio 89.5fm in Cape Town – launching Saturday the 2nd June 2012 at 3pm – available via internet / mobile phone across the world) will have something for everyone – those to whom biking is a hobby; others who see it as a lifestyle and for those who believe biking is life itself! This two-hour show will have weekly features on road safety, featured bike of the week; club of the week; general biker news; special guests and will strive to be a show with no holy cows – if it needs to be aired for debate and transparent discussion, it will be dealt with on The Biker Show. It’s not a talk or a music show – it’s going to be a crazy, funky, zany, fun, great show filled with music, biker camaraderie, dedications, an SMS line (32158) or via Mxit, and club activities advertised for free! The show will have three anchor presenters – all bikers affiliated to clubs in Cape Town. If a club is selected for club of the week, the in-studio representative will be the guest presenter for that particular show. Feature segments like Bike of the Week; Bike Safety etc will be presented by a specialist guest presenter that is skilled and knowledgeable about the particular subject. Apart from tuning in via conventional radio (89.5FM in Cape Town), you can tune in via Internet audio-stream, Blackberry, Raspberry and any other berry. And if you miss the broadcast of The Biker Show it will be available to download. The show and its presenters will be available for live outside broadcast from club day jols and rallies (at a fee). Your ideas, opinions and input for the show are welcome. Special inaugural advertising rates (dirt cheap). Want to sell or buy a bike; looking for spares – we will broadcast it. Mail Trevor with your club activities; contact details and any questions or ideas you may want to share. For advertising and promotional consideration contact Isherene via e-mail or on 021 448 5450.